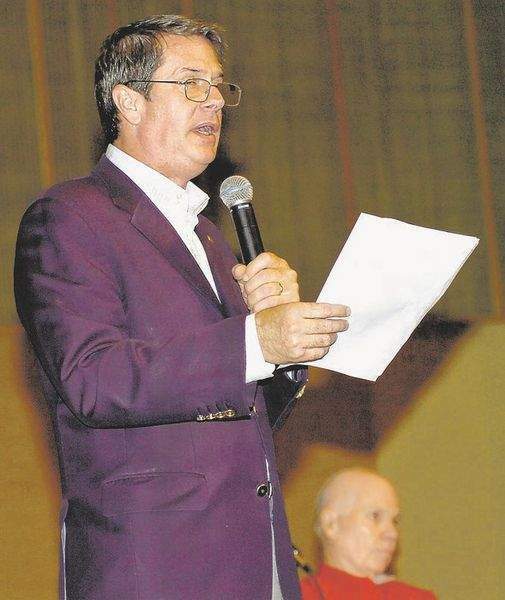 With all the work that went into the pre-production of David Vitter Presents A Town Hall on Health Care– pre-screening and selecting questions, refusing questions from the media, assembling a panel of like-minded conservatives- you’d think Mr. Vitter would have chosen a different jacket. We can all thank The Town Talk for this picture. In all seriousness, something that has not been reported: According to a friend of mine who was there for the entire production, prior to meeting, outside of the Guinn Auditorium, a small group of protesters (?) chanted, “Kill Nancy Pelosi!” It sure would be nice to locate video footage of this. Another memorable moment, I’m told, is when one of the panelists declared, “I don’t want someone to decide to end my life before I’m born,” which seems like a koan ripped from the pages of a book of Zen poetry. The Louisiana Republican spoke at what was billed as a town hall meeting at Louisiana College’s Guinn Auditorium. It was a friendly audience but there was little chance for disagreement to be expressed. The panel of speakers all joined Vitter in opposing the reform package being debated in Congress. Questions from audience members were screened and selected in advance of the event. Update II: Actually, Greg Peters says it best. Check your facts. Vitter’s questions were screened and pre-selected. Obama’s questions were not pre-screened. http://blogs.wsj.com/washwire/2009/08/11/live-blogging-obamas-town-hall-meeting-2/. The difference is that (like Bush) Vitter’s town hall meeting questions are screened to make sure that he doesn’t have to answer objective questions, only those that feed into his talking points. The president did a good job today sincerely answering thoughtful questions from a variety of different points of view. if you think there were no planted questions at that meeting, then you are either naive or a fool, possibly both. Dan, what’s with the hostility? Michael was just pointing out that the conservative Wall Street Journal, owned by none other than Rupert Murdoch, reported President Obama was NOT “pre-screening” any of his questions, and if you watched his town hall, it certainly seemed like it was unscripted. As the White House said today, it’s almost as if conservatives are upset that no one yelled at the President. There is a huge difference between the ways in which Vitter (and Bush) conducted his town hall meetings and the ways in which Obama and many of the Democrats have conducted theirs. You know, allowing dissent, encouraging the free exchange of ideas, etc.